I didn't have a lot of time because weather turned out to be nicer than expected. So by the time the beach was clear enough tide was on its way back in. Lots of onshore winds at this beach, so sand was full of seaweed and other debris. Not the best conditions but I was riding no matter what. That said... It was friggin great. This thing rides soooo smooth. Fits like a glove with my harness on. No rattles and squeaks as every connection point is bolted. I am still waiting to receive a small fork for the Landseglers, as well as a set of bigfoots. Running the Landsegler in the wide fork was a bit twitchy on the front end. Like flying a 6m on a 15m bar. But all in all amazing first impression. Enough to relieve the sting from the price of admission. Was so eager to ride I didn't start my strava or Gopro. All i have is some crappy cell phone video. That thing is even more impressive in real life. You looked like you were booking, even in all that bumpy garbage. That seaweed was pretty impressive too. By the time I left, the waves had turned black with it - I tried to rinse my board, and came out covered in it. Congrats on the new toy! Always great to see ya. Great to see you and meet Dave. I saw him finally get up on the water with his 15m. I was totally booking. Bigfoots would have been better. No gps, but I know my old PB is gone. Down by the west end where the beach was clean it was really gusty. Turbo boost was crazy right before the rock wall. Yeah - that end section was the only clean, flat area, and the extra wind and foam hitting me in the face made it even better. Only spot I could really crank in the bar. Now you can spend the day scrubbing seaweed off your bug with a toothbrush. The fun never ends! Great looking buggy and you look even better in the new bug. I have always liked the idea of a tow handle just don't want to have to leave it somewhere. Besides if I broke down for whatever reason I would have to walk back to get the tow bar so I could tow it back to the truck. Thanks Jeff. Its feels better too. First session I didn't hurt after. Was very impressed with the perfect fit having placed the order solely by email. Buying from a vendor I have never met. However Rich gave a good recommendation so I new I was in good hands. For anyone considering a new bug GT is certainly worth looking at. They have a new model coming out GT Raw that is a bit smaller for cruising and tricks. Base price not much more than a PL. Man, that buggy is gorgeous! Well played young man, well played. Looks awesome! Have fun with your new toy!!! All I can say is, riding this thing makes me feel like what I did before was something other than kitebuggying. Not knocking my PL buggy, but at 6' and 220lbs I always felt cramped in my PL. I have stomach issues, so sitting in the fetal position while riding always kept my seat time short. Not to mention I was always afraid of being yanked out. This buggy gives you the confidence to go. Yesterday winds were in the upper 20's and gusty. Not to mention the tide never really went out as the wind was dead onshore and blowing hard. So we were dodging waves the whole time. Not much room to ride here, but still more fun than a barrel of monkeys. This buggy is heavy and stout. The axle alone weighs about as much as my PL bug. However it feels as nimble as a ballerina. I have never ridden in winds that high, but sitting deep in the cradle gave me a ton of confidence. I know in prime conditions this thing is gonna be fun. Even in yesterday's sketch fest I managed 34.8 mph. I know with those high winds I could have done more, but played it safe. I was flying 6m Phantom for first time and it was a handful. You really cannot feel this kite in the air, so keeping an eye on it is key as it moves around so fast. Not to mention it was jellyfishing and oscillating which kinda freaked me out. The duro bigfoot tired are amazing. Soaked up bumps and ruts like they weren't there. Never thought I would ever say I can't wait for summer to end. Looks to be perfect for you. Nothing inspires confidence like having a buggy that is never the weak link. GT seems to be the one to buy if you want the best these days. I hope to get to share a beach with you one of these days! Quick clip from yesterday. My camera fogged up, so most footage is trash. On second half you can see how the kite was behaving. Very Awesome Marc!... Yes, you should come to JIBE. I am jealous! I have been lusting after a GT for a few years now. 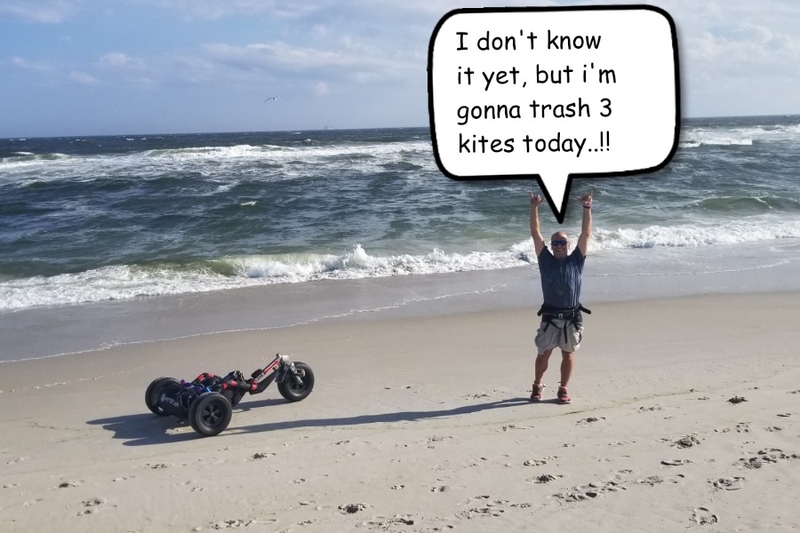 If I didn't just buy a Blokart, I would say this post of yours would be the straw that broke the camel's back and convinced me to go for it. @Mougl - sorry to hear that. Don't worry, Labor day not far off. Empty beaches. The beach on Marco Island is usually pretty empty, just no wind lately! Is the red tide by Sanibel hitting you there mougl? Looks pretty devastating. 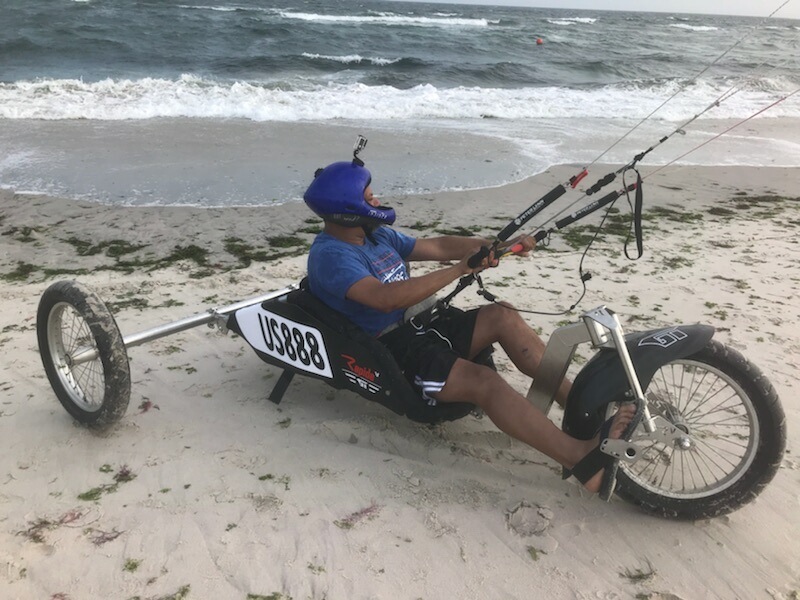 I am in NYC and really want to find a beach nearby to learn to landboard. What beach do you guys go to that has hard sand like in your video? I have tried flying and boarding in van Cortlandt park but the wind was way too choppy to keep my kite controlled. 24K, shoot me a U2U with your number. Sorry for the delay, just saw this. Yes. The red tide here is terrible! They have given the green light to go into the water at a couple of local beached but I am not risking it. I have a friend that lost a leg when this happened a few years ago and I am not about to risk it myself. Sorry to hear mougl. Such a beautiful coastline there.